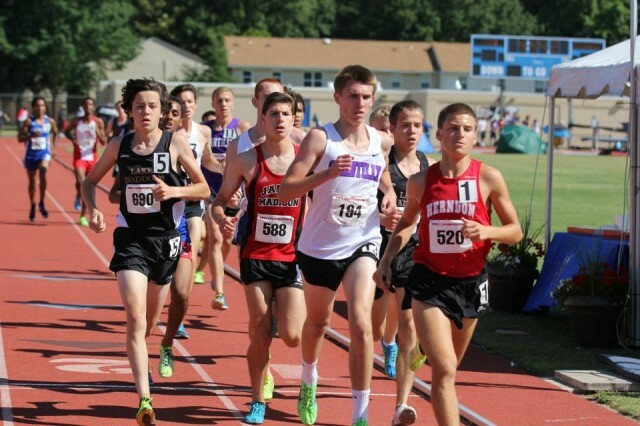 On back-to-back weekends, local high school distance runners performed well at Virginia’s state meets and the national outdoor championships. The top performance at New Balance Outdoor Nationals in Greensboro, N.C. June 13-15 came from West Springfield’s distance medley relay team, which ran 11:39.45 to win thanks to performances by Katie Kennedy, Michelle Lipka, Reagan Bustamante and Caroline Alcorta, who lowered their 11:51.45. Lake Braddock was third at 11:52:17. The Spartans were also third in the 4×800 at 8:58.32, and Poolesville was 27th in 9:31.67. In the girls 4xmile, Lake Braddock finished 23rd in 21:33.87. In the boys two mile, Loudoun Valley’s Andrew Hunter, a sophomore, finished second in 8:53.81, just 0.22 back from first. George C. Marshall senior Mackenzie Haight was 13th in 9:41.82. Haight ran 14:53.72 to finish 10th in the 5k, ahead of Poolesville senior Chase Weaverling, who ran 14:55.59. In the boys mile, St. Albans senior Tai Dinger was second in the mile in 4:08.23, less than 1.5 seconds from first. Hunter was 11th in 4:10.94 and Oakton senior Jack Stoney was 15th in 4:13.81. Robinson senior Macey Schweikert was 16th in the mile at 5:00.24. Oakton’s boys were 27th in the 4×800 at 8:02.42. Lake Braddock’s boys were 11th in the Distance Medley Relay in 10:19:47.